In recent years social media has become the main medium for sharing opinions and information. One of its functions has become to gauge the majority opinion in a society. An interesting case to look at in this respect is of stereotypes about the ‘other’. Social networking has a role in perpetuating stereotypical views of Indians in Pakistan, and vice versa. Many Pakistanis see Indians very directly as the ‘other’, and being ‘not-Indian’ has been am important part of the construction of the Pakistani identity. National ideology and traditional media aid these views. This raises some important questions. Is the enmity between the countries being encouraged by political organisations? Or has it just become part of the national psyche? The two countries have been “enemies” since their independence from British rule in 1947. As new countries, these neighbors have had to fight over land and resources and still have existing border disputes. Their faceoff is so aggressive and long standing that it is part of the national education curriculums in both countries. 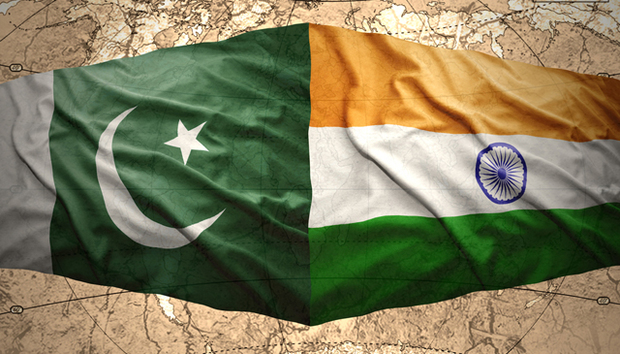 Rather than looking at the reasons for partition of the Indian Subcontinent, let’s look at the standing issues that are a roadblock in the way of peace between India and Pakistan today. There are two main political issues that repel peace between the countries, and these issues have been present since 1947. The first is that of the disputed region of Kashmir and its settlement. Neither country is willing to give up its claim to this territory, and India especially does not want Kashmir to have a referendum to decide its own fate. The second issue is that of water. Two of the five rivers that flow though Pakistan have their origin in India. Indian control over water can wreak havoc with Pakistan’s irrigational capacity and water shortage and this keeps Pakistan constantly on edge. Pakistan is an agricultural country and the water issue is of primary importance. According to a PEW Global Attitudes study from 2011, only 14% of Pakistanis see India in a positive light. This is to the extent that a majority of Pakistanis consider India a more serious threat to their country than al Qaeda or the Taliban. This stereotyping of India on the part of Pakistanis has a complete disconnect with reality. There have been more Taliban attacks in Pakistan in the last five years than any armed conflict with India. But Indian attitudes toward Pakistan are also equally negative - 65% of Indians expressed hostile opinions of Pakistan. People on both sides agree that relations must be improved, but since policy is top down, not much has been achieved on the diplomatic front. In fact, the new Bharatiya Janata Party government under Prime Minister Narendra Modi has been giving aggressive statements against Pakistan and political relations are continually tense. For their part, Pakistanis hate the new premier, and see him being responsible for anti-Muslim riots in the Indian province of Gujarat in 2002. In such a context, the negative attitudes make sense and it is easy to imagine that these would appear on social media sites. Facebook is the primary medium where news reports are shared. But an interesting development is that a lot of the important Pakistani English papers and blogs have a significant Indian audience, while the reverse is not true - not many in Pakistan read and comment on Indian websites. The websites of these newspapers often have Indians posting comments on articles that have to do with security and trade with India. More often than not, these comments turn into arguments and are sometimes extremely derogatory. The Friday Times, a Pakistani weekly, and The Nation, a daily newspaper, seem to be the two most popular. The Pakistani blog, Pak Tea House also has a very large and active Indian audience. This debate between Indians and Pakistanis is present on social media as well. Last month Pakistan accused Indian troops of shelling its territory along the disputed Kashmir border. Such border skirmishes are continuous news items and ignite social media battles every few weeks. This often results in expletives being used for each other. A Facebook user from Islamabad in Pakistan said, “Social websites are the best place to express emotions. That is why I made a group to answer Indians, who are also using social media as [a] propaganda tool against Pakistan.” This points to the fact that social media is not being used as a tool by political organisations, rather people on both sides of the border have such embedded views that this type of discourse is a national problem and part of the national psyche. The media has a key role in the India-Pakistan peace process, especially as there is no real open battlefront. A soft strategy to improve relations can work. Social media can function as a classroom to promote understanding. There are pages that try to do this. One of them is titled, “Romancing the border”, to promote cultural sensitivity and acceptance of the ‘other’, redefining the other as being similar to the ‘self’. Yet one must remember that in the international arena, national security comes first and mutual benefit comes second. Peace and the end of hate are not priorities when one country has a resource crisis and the other a security dilemma. South Asian journalists tend to remain entrapped in jingoistic nationalism and the role of the media has been limited to institutionalised exchanges and conferences. Though traditional and new media can help to create positive images of the other country and counter the traditional views of the ‘enemy’, it cannot just wish political peace into being. Diplomacy is carried out by those in governmental power and position, far removed from the citizen’s political life. Either a political peace is hammered together by the top politicians of the government, or general perceptions change enough among the populations of India and Pakistan that they pressurize the government though the democratic process to negotiate peace. At present, neither the population, the media, nor government, has gone far enough in its efforts to catalyse such a change. « Top Tips: 5 Ways to Avoid "Document Anarchy"